Need a little something to brighten up your day after the last 15 days of rain? Look no further! 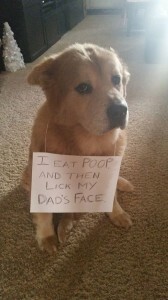 The “28 Best Dog Shaming Photos” from Barkpost should do the trick! Do you have any dog shaming (or cat!) photos to share? Let’s see your best ones! Post them to our Facebook page! Here’s one of our patients, Tank, spilling his secrets! Thanks, Bethany D. for the picture!